Now picture all the activities that occur in your bathroom, but imagine it being cold. Even a hot bath or shower could be ruined by exiting the water to be greeted by an unforgiving artic chill. A radiator is, of course, the solution to a chilly bathroom. If you’re tight on space or looking to keep your room warm at the same time as your towels, a Towel Radiator could be the answer to bathroom comfort. If you are searching for the best handpicked radiators, then Great Rads is your one stop shop! Our radiator towel rail provides towel warming perfection alongside the typical room heating qualities you’d find in a standard radiator. We at Great Rads have assembled an unrivalled range of towel rail radiators so you’re bound to find one that suits your home décor, no matter your taste and style. Our wide range of different sizes and finishes are specifically designed to cater for your needs, which is why Great Rads is considered amongst the best suppliers in our niche! Additionally, our wide range of towel radiators can be used in almost any bathroom setting whilst creating both appealing designs and practicality. 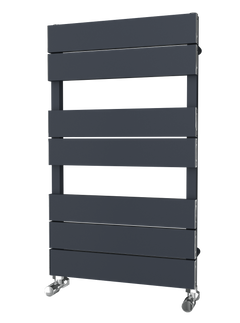 The contemporary towel radiator more commonly known as a heated towel radiator is perhaps one of the most overlooked, yet commonly used household items, especially in your bathroom. Whilst you may take them for granted, they are solely designed to keep your towels warm and cosy! With summer approaching you may not be thinking about this now, but imagine being wet after a shower in your cold bathroom in the winter. At Great Rads, the radiator towel rail not only assists you in freshening up, but also keeps your house environment safe and secure. Most families opt for towel rail radiator in their bathrooms as it is easy to install and they don’t have to endure the expensive and taxing process of installing bulky radiators. 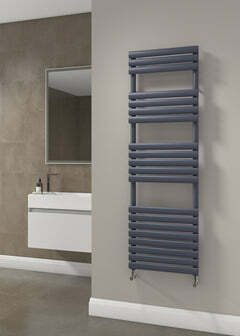 Aesthetically, many people consider the towel rail radiator a stylish and attractive option. We at Great Rads have an endless choice of towel rails available, and its sleek and shiny exterior can give your bathroom an ultra-glossy appearance. As we have mentioned before, the options are nearly endless! Depending upon your own personal taste and the space you have available you can opt for any of the above styles and we’re sure to have a design to suit you. 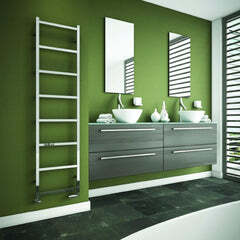 For instance, if you are looking to achieve a modern look, we’d suggest going for a flat chrome towel radiator. On the other hand, if classic chic is your thing, then a more traditional type would be the best. At the end of the day, however, the choice is completely yours! A Radiator Towel Rail is the latest “must-have” along with our other designer accessories, as they offer so much to your bathroom. We provide plenty of options, so you can opt for anything right from a small towel radiator to electric towel rails in order to keep your bathroom as well as your towels warm and cosy. Whether you have a small bathroom or larger one, Great Rads is at your disposal to provide you with some of the best towel rails on the market. Our towel radiators not only warm you up, but also make your bathroom look stunning! Typically, having a bathroom with warm towels is always nice, and of course the most obvious benefit of having a radiator towel rail installed. Towels don’t take long to warm up, so having cosy towels in less than ten minutes is something of a treat! In addition to this, it also adds an extra design dimension to your bathroom. Depending upon your bathroom, towel rails can either be wired directly into a wall or be converted to use in a standard plug socket. The process of installation is relatively straightforward and most rails come with a long-term warranty. When you opt for a traditional towel radiator you can choose from a variety of options. All of them are offered in different sizes, styles and finishes, which can complement the décor of any bathroom suite. Once seen as a luxurious accessory for the elite, Great Rads heated towel rails are truly affordable and now available within almost any price range and budget. An Electric Towel Radiator is typically considered to be quite expensive, but even so, these always turn out to be a wise investment. Looking to buy towel radiators? We all like nice, warm towels whilst coming out of the shower or bath. So, why not invest in something that keeps you and your bathroom cosy and snug? Central Heating or Heated Element? First things first, before you purchase the traditional towel radiator consider whether you’re going to connect it to the central heating system or make use of a heated element instead. The main difference between these two is that the centrally heated radiators work predominantly during winter. Thus, in order to warm towels during the summer, you’ll need to turn the entire system on. Whether this is suitable is a matter of personal taste. Before deciding upon the size, consider its usage. Is it for your family bathroom? A small ensuite? This could be the difference between purchasing a large or small towel radiator. Also, take a look at its BTU (British Thermal Unit) output. This is the measure by which you can rate the heat output of your radiator. The installation location is less important, especially if you are living in a modern, insulated home. Ideally, however, your traditional towel radiator should be placed on the coldest wall in the bathroom. Often, the outside wall with a window on is the best one, if you have the space. If this isn’t possible fix it on the opposite wall of the room. This ensures that heat is thoroughly circulated in the room, increasing efficiency. Wall Mounted or Floor Standing? Depending on the available space, you can either opt for a floor standing or wall mounted model. The latter is ideal when floor space is at a premium, for instance in smaller bathrooms. We at Great Rads are a fast-growing radiator distributor, based in the UK. We offer the best products along with the sort of specialised and personal customer service we’d like to receive ourselves. 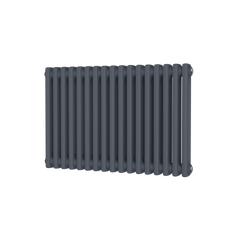 We offer some of the finest radiators available and are proud of our suppliers. With years of hands on experience in the industry, business and design, we have secured a dazzling range of handpicked radiators, which are delivered to your door step with a diverse price range to suit everyone. Get in touch with us today for enquiries regarding our range of radiators. To see what we can do for your bathroom needs, call us for free on 01803 450330 or drop in an email on sales@greatrads.co.uk.